Back in January, longtime Fox News host Megyn Kelly left the network to join NBC News. Recently, it was announced that her new Sunday night show on NBC would premiere in June. And now, if a recent trademark application is any indication, that new show might have a [predictable] name. 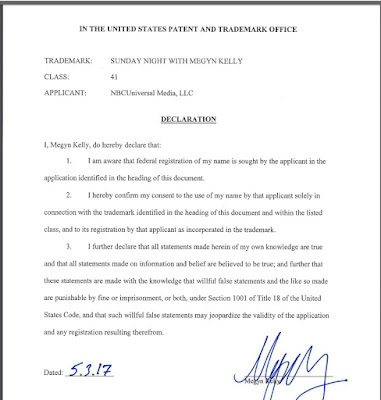 On May 5th, NBCUniversal Media, LLC filed a federal trademark application for SUNDAY NIGHT WITH MEGYN KELLY. The application covers "Entertainment services, namely, an ongoing television series featuring politics, business, news and public affairs rendered through the media of television, cable, satellite, and broadband systems, via the internet, and portable and wireless communication devices" in Class 41. NBC filed the application on an intent to use basis, which suggests the network is not currently using the trademark in commerce but has a bona fide intention to do so in the near future (which makes sense considering the show is not set to air until June). See 15 USC 1051(b). This is the first application related to Megyn Kelly filed by NBC. 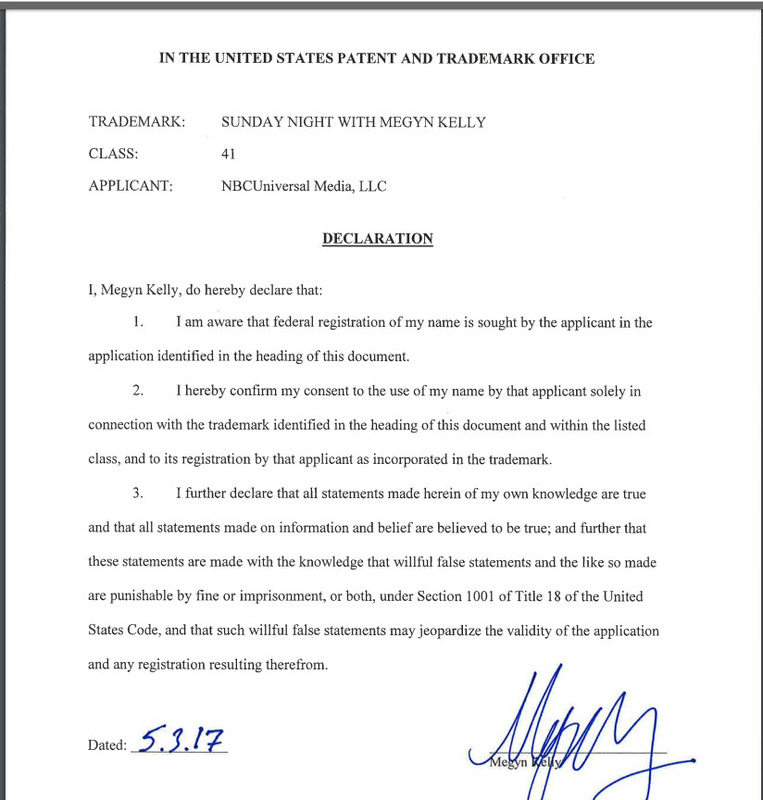 Along with the application, Megyn Kelly submitted a declaration consenting to the use of this trademark and its registration with the U.S. Patent and Trademark Office (above). Such a written declaration is required when a trademark consists of or comprises a name (including nicknames), portrait, or signature of a living individual. See 15 USC 1052(c). So is SUNDAY NIGHT WITH MEGYN KELLY the name of her new Sunday NBC show? The application doesn't guarantee NBC will go with this name, but the "bona fide" intention requirement of the Trademark Act does require that something more than just an idea be in the works for the mark. Stay tuned.